MONTREAL — John Tavares hasn’t made any decisions on his future, but he clearly stated Monday morning where his preference lies. Tavares is playing out the final season of a six-year, $33-million deal, and if he goes to July 1 without re-signing, he will be the biggest NHL free agent ever to hit the market. 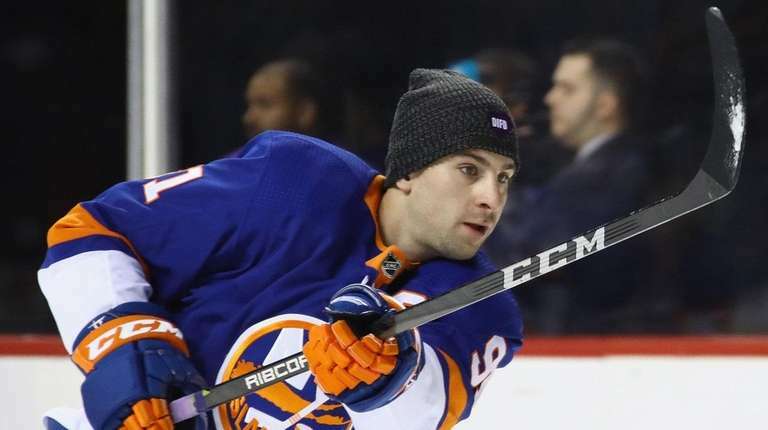 He declined to discuss a new deal after last season, choosing to play out this final year before committing to the Isles or seeing what else is out there because of a number of factors regarding the future of the organization. The arena deal at Belmont Park has answered one big question for Tavares, but there still have been no contract talks between Islanders general manager Garth Snow and Pat Brisson, Tavares’ agent. When Tava res and Brisson are ready to talk numbers, the Isles will be all ears. They seem ready to lavish the biggest contract in the NHL on their captain. Tavares scored twice in the Islanders’ 5-4 overtime win over Montreal on Monday, giving them a 4-2 lead with a shorthanded breakaway goal and winning it at 1:51 of OT. He has 24 goals and 30 assists in 45 games. Until he gives the OK, however, the Islanders must wait. “I feel good about it,” Doug Weight said Monday. “We know the situation we’re in with John. I trust John to his word. I believe he wants to be here. He’s earned the right, whether it’s free agency or waiting to sign a contract, he’s earned the right to check off all the boxes. It’s his right as a professional and what he’s done for us as an organization, a captain. So we can’t be focused on it. Tavares declined to answer other questions from the Montreal media regarding his future. “I don’t really focus on it on a daily basis too much,” he said. “You get into the season and you’re so focused day after day on how you can improve, especially this part of the season with how important every game gets. That’s where I try to keep my focus and let that play out over time.